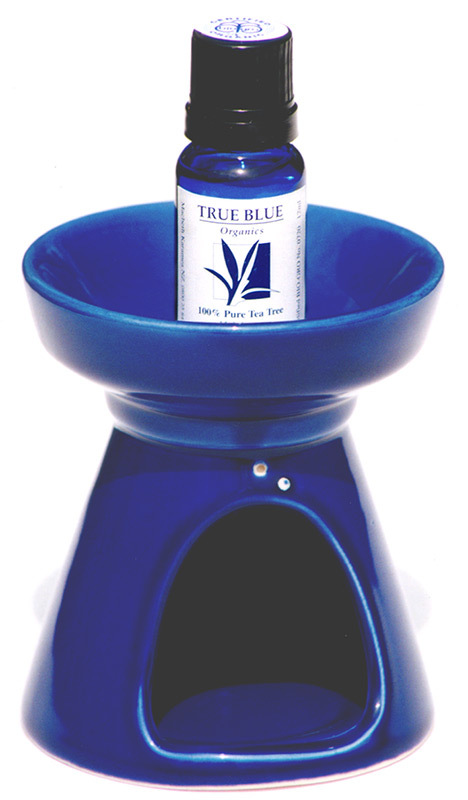 Tea Tree oil (TTO) is one of those important essential oils to have in the home. It is effective in the prevention and treatment of many common conditions and is mild on the skin. Tea Tree Oil is particularly useful for infected skin conditions, for fighting fungal diseases, for respiratory ailments and for treating problems of viral origin. It is effective against a wide range of bacterial organisms and has excellent absorption into the skin. Our True Blue range of personal health and skin care products utilises Melaleuca alternifolia’s (Australian Tea Tree) well documented antifungal, antiviral and antibacterial properties. Abrasions, bites & stings, blisters, bruises, minor burns, cuts & wounds, splinters: Apply direct. Bacterial Acne, boils, blemishes, impetigo: Apply direct. Viral Cold sores, warts and verrucas: Apply direct. Shingles, chicken pox: Dilute & bathe affected area. Fungal Tinea – athlete’s foot, ringworm, barber’s rash: Apply direct. Other: Candida – Vaginal thrush: Soak a tampon in a 1% solution (20 drops TTO/100ml purified water) and insert. Replace every 3 hours. Nappy rash: Wash in warm water + 3 drops TTO. Corns, calluses, infected nails: Apply direct and regularly. Eczema, psoriasis, scabies, chilblains, ulcers, heat rash: 5 drops TTO to 25ml water. Wash affected area regularly. Essential oils help relieve mental, emotional & physical problems. They stimulate the body’s immune system by absorption into the blood stream or application to the skin. 2 drops on tissue or in a basin of hot water. Cover head with towel. Inhale steam for 5 minutes. Bath: Add 8-10 drops to warm bath (children 3 drops). 8 drops TTO to warm water in burner. Massage: To relieve stress-related disorders, aches and inflammation: 8 drops TTO to 20 ml sweet almond, avocado or sunflower oil. Ulcers & abscesses: Apply direct and frequently. Sore throats & infections, inflamed gums, halitosis: Wash mouth & gargle with 2 drops TTO in 50 ml warm water. Repeat 2-3 times daily. Head Lice: Shampoo daily with 20-60 drops TTO to 100 ml mild shampoo during an outbreak. Leave 10 minutes before rinsing. Add 2 drops to final rinse water. As a deterrent: Dab 3 drops onto scalp before school or dilute in sprayer. Dandruff: 2-5 drops of TTO to 5 ml mild shampoo on a regular basis. Abscesses, cuts, splinters, chafing between claws: Apply direct. Itches & skin care: Wipe coat with sponge moistened with 20 drops TTO or brush with diluted solution. Fleas, mites: 20 drops TTO to 250 gm baking soda or cornstarch. Dust on dogs, poultry, cats (sparingly). Effective against mud fever, seedy toe, foot scald, lice & fly strike: Apply dilute solution. They are super sensitive to Tea Tree essential oil. 5-10 drops TTO in 4 litres water. Stir in & soak overnight, then wash.
General cleaner: Use on all surfaces in kitchen, bathroom, toilet: 20 drops TTO to 100 ml water. Carpet freshener: 50 ml TTO to 250 gm baking soda. Mix in glass jar overnight. Sprinkle on carpet & vacuum after 20 minutes. There has been a significant increase in interest among dairy farmers in the potential of Tea Tree oil to help them with treating mastitis organically. Mastitis is one of the three big animal health issues for organic dairy farmers who cannot routinely use antibiotics. Tea Tree oil has great possibilites to help control the bacteria that cause this condition. Tea Tree Oil is currently used by many farmers and is acknowledged in a fact sheet “Organic Management of Mastitis in Dairy Cows” distributed by the Organic Dairy & Pastoral Group. Thank you for prompt reply. To date we are using the tea tree oil for two things one being mastitis as our calving is just under way we haven’t had a need to treat the new mothers. We did however have a cow with mastitis that hadn’t calved and we brought her in and treated her with a mixture of tea tree and olive oil at 1ml tea tree to 4mls olive oil and injected into the infected teat 2x daily for 3 days we then gave her a double strength tea tree oil to 3mls olive oil for her last treatment. We also used homeopathy to assist her. We are watching her closely to see how she improves. We did note that the treatment cleared the worst of the mastitis. ‘I recently cut my index finger with the bread knife and the cut has healed over super quick thanks to your biogro tea tree oil. Using the tea tree oil kept my finger clean and fighting off any infection. It really was quite miraculous seeing the skin bind together like that. Until reading your product info I was unaware it has analgesic properties.